This report by SiriusDecisions validates ZINFI’s ongoing industry leadership and its role in redefining partner relationship management under the broader framework of Unified Channel Management. ZINFI’s unique approach to channel management automation is based on the conviction that, while Partner Relationship Management (PRM) is a very important element of Unified Channel Management, PRM must be integrated with Partner Marketing Management (PMM) and Partner Sales Management (PSM) solutions to successfully address the full spectrum of channel management challenges end to end. 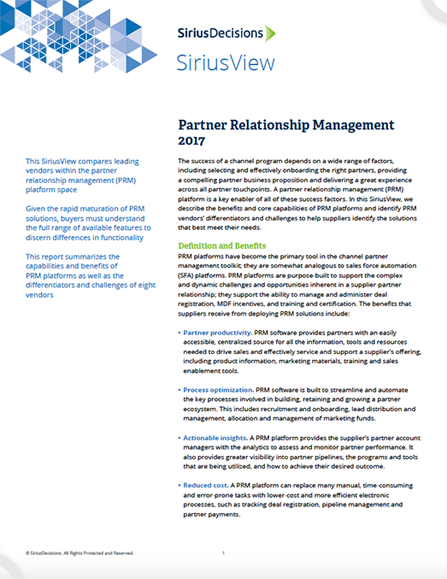 Thank you for your interest in reading the SiriusView Partner Relationship Management 2017 Report. This report has expired, so please contact SiriusDecisions directly – or visit their website (siriusdecisions.com) to gain access to this report. Alternatively, please read our press release here.